Brian's grandson Stephen has sent a special message of thanks to all Cloughie fans, on what would have been his 84th birthday (21st March 2019). Fans have been sending their memories to this website ever since Brian passed away in 2004. Stephen, who is the son of Cloughie's son Simon, expressed his appreciation for all the good wishes. He said: "Reading all the kind words after 15 years is brilliant for the family. So thanks to the club and the Forest supporters for keeping my grandad's memory alive, he'd have loved it." You can read messages and #cloughiememories HERE. You could win a book signed by Cloughie himself. To mark what would have been his 84th birthday (21st March 2019) we're inviting you to send your favourite photos of Nottingham's brilliant Clough statue. The one judged to be the best (ideally with an accompanying story behind the photo) will win the signed paperback of Walking on Water. Full details HERE. 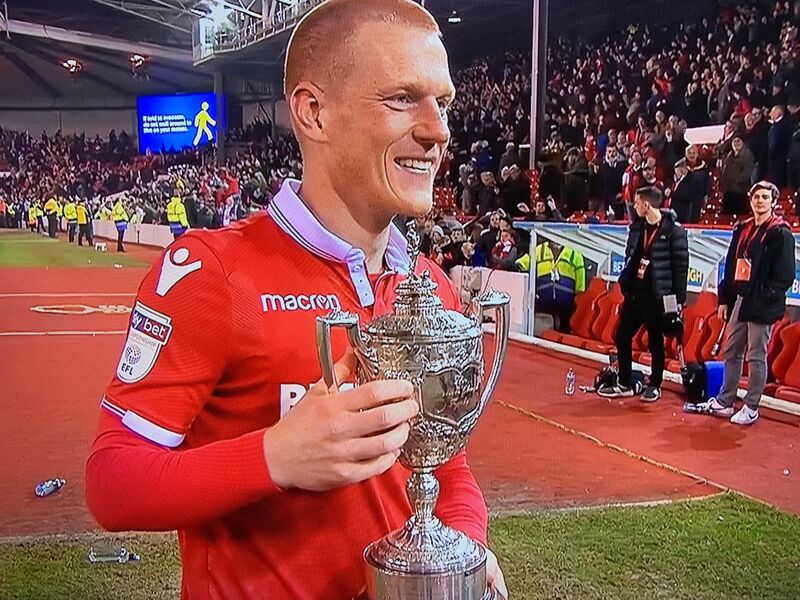 The Brian Clough Trophy returned to the City Ground after Nottingham Forest beat Derby County 1-0 at home in a Championship match (February 2019). It's the first time the Reds have held the prestigious piece of silverware since November 2015. The Monday night game was shown live on Sky Sports. You can find out more about the Brian Clough Trophy, including previous matches, HERE. 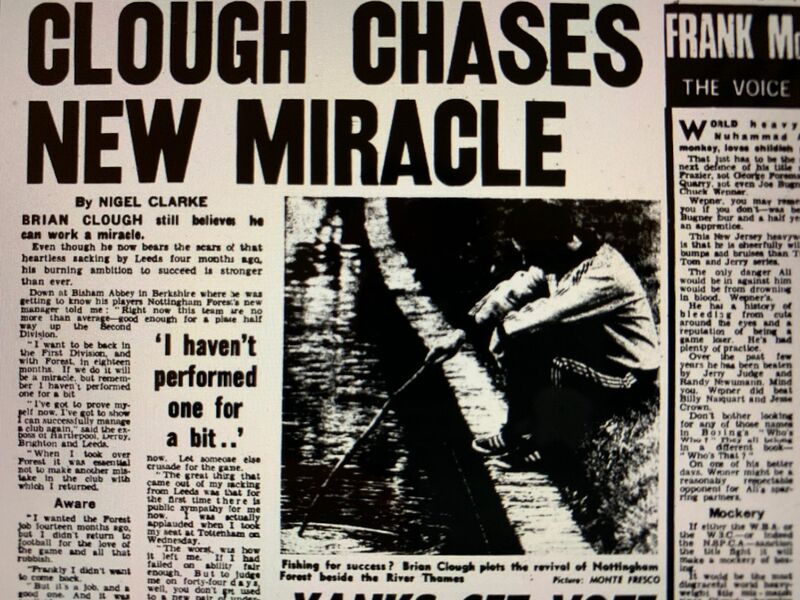 It was forty-four years ago that Cloughie declared he could still work a miracle, just days after becoming Nottingham Forest manager. The Daily Mirror reported (January 1975) that while he still bore the scars of the 'heartless sacking' by Leeds four months previously, his burning ambition to succeed was as strong as ever. During a visit to Bisham Abbey with his new players, he told the Mirror: "Right now, this team are no more than average - good enough for a place half way up the Second Division. I want to be back in the First Division, and with Forest, in eighteen months. If we do it, it will be a miracle, but remember I haven't performed one for a bit." Luckily for Forest, a Clough miracle was just round the corner. Brian's son Nigel says his Dad would have loved to have included Manchester City's David Silva in his European Cup winning teams. Nigel, whose Burton Albion side face City in the Carabao Cup semi-final (January 2019) also says his Dad would have admired City boss Pep Guardiola. "I think my Dad would have loved the way Pep goes about his job and the way City play," said Nigel. "And when you see a player like David Silva, I can guarantee that Dad would have had him in his team every day of the week. He would have absolutely loved to have had a player like David Silva in his team. "Nottingham Forest had John Robertson, who wasn't the same sort of player because he was a winger, but he would just tell the Forest players, 'Give him the ball - I don't care where he is, just give him the ball and let him get on with it' - that's what he said about John and that's what he would have said about David Silva. He'd have loved him." The Brewers boss also said his Dad would have been impressed with the way his side had beaten Middlesbrough (where Brian started his playing career) in the previous round. "I think he would have been proud of our clean sheet and the performance we put in," reflected Nigel. Brian won the League Cup four times as Nottingham Forest manager, with Nigel playing up front in their back-to-back wins in 1989 and 1990. "It's funny because when we play in all yellow, as we did (against Middlesbrough), Forest did it many, many times away from home in an all-yellow strip," added Nigel. "I'd like to think there were a few characteristics there - nowhere near as good and at the same level, but the same sort of commitment." November 2018 marked ten years since Nottingham's brilliant Brian Clough statue was unveiled by Mrs Clough. More than 5,000 people turned out on a weekday morning to see the sculpture for the first time. World renowned sculptor Les Johnson was widely praised for the likeness of Cloughie. Mrs Clough described it as perfect. Many of Brian's former players attended the unveiling, along with members of he Clough family. The event followed an amazing fund-raising campaign by a small group of volunteers who smashed their target in 18 months. To mark the tenth anniversary we have uploaded two special reports from the archives. The TV reports feature former players, Mrs Clough and her son Simon, and coverage of the fantastic event which was covered by TV and radio stations from around the world. The statue has become a much-loved part of the city centre landscape with visitors having their photo taken alongside the sculpture. You can see a report from the day (plus the TV reports) HERE. To celebrate the anniversary there's also free postage (and 25% off) on the book which tells the full story of the statue: Young Man. 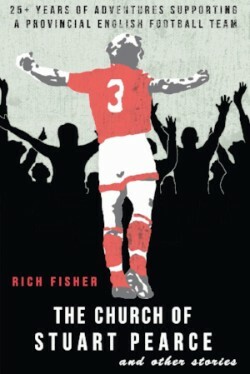 Statue fund committee member Rich Fisher has also recorded his memories of the campaign, reading one of the chapters of his book 'The Church of Stuart Pearce & Other Stories'. There's more HERE. Forty years ago Cloughie was remarking on the lack of national recognition for his Forest team after the Reds beat AEK Athens 5-1 in the second leg of their European Cup tie (1st November 1978). Forest won 7-2 on aggregate to go through to the quarter-finals at the first attempt. But Cloughie was keen to make his point. Referring to the next time they'd play in the competition, he said: "We need a breather now until March. We have a small squad and we've got a few injuries. I think we'll have to go two years undefeated before someone says we're a good team." Forest had suffered just one defeat in 58 league and cup games. We can reveal how a managerial masterstroke by Cloughie helped his Forest side overcome a hostile atmosphere in their first overseas European Cup match forty years ago. The Reds had travelled to Greece to face AEK Athens, after dumping holders Liverpool out of the competition. The Greek fans were passionate and noisy and created an intimidating atmosphere in the stadium (18 October 1978). But speaking exclusively to this website, Brian's sister in law June, who was among the 36,000 crowd in Athens that night, described how Brian ensured his players were not intimidated. June Clough's memories of that special night in Greece are recalled in a special report on this website. Forest won the first leg 2-1 and afterwards Brian told the media: "The press lost this game for AEK. They expected them to win 3-0 and the players froze from fear when they soon realised this was not going to be the case." The Greek trip was also notable for Clough's spat with defender Larry Lloyd who refused to wear his club blazer for the flight home. He said it was at the bottom of his suitcase and there'd been no official order to wear the jackets. Brian told the big defender he would be fined and, when Lloyd protested, the fine was increased. Lloyd was told he'd be dropped for the next league game - and he said he wanted a transfer. But Lloyd eventually paid up and continued to be a key part of the European Cup winning team. Trevor Francis has described Cloughie as utterly 'compelling'. Francis, the scorer of the goal that won Clough the European Cup in 1979, says his former boss was a 'one off'. "I'm not sure exactly what a genius is, but he must have bordered on being one," said Francis. "At times, some of the things he did were quite eccentric, but it always provided results." Francis told a BBC Radio Nottingham podcast (October 2018) that wherever he goes, people ask him what it was like to play for Clough, even all these years later. "I can understand that. Even when I wasn't playing for him I wanted to hear what he had to say when he was on TV. He was compelling viewing." It’s forty years since Cloughie’s Forest dumped holders Liverpool out of the European Cup. A goal-less draw at Anfield meant Forest went through 2-0 on aggregate (September 1978). Tony Woodcock recalls: “Clough was superb with us when we went to Liverpool for the second leg.” He kept the players waiting before they left the hotel for the journey to Anfield. The Forest players were on the coach waiting to go, but there was still no sign of Cloughie. With just an hour to go before kick-off, Clough and his assistant Peter Taylor appeared. Their reasoning was that everyone would be in the ground, so the roads would be clear for the journey. No hold-ups. They didn’t want the players hanging around and worrying. The players were also given instructions on behaviour. “They made it very clear,” said Woodcock. “Absolutely no gloating. Straight off the pitch. Changed immediately. Straight on the coach. Straight back to Nottingham. "And that’s what happened. We drew 0-0 and that (over two legs) was probably still the greatest of our victories." Woodcock’s memories are included in ‘The official history of Nottingham Forest’ by Philip Soar (Polar Publishing). 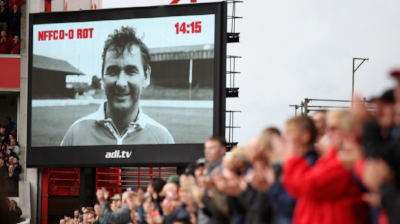 Fans paid tribute to Cloughie with a minute's applause to mark the fourteenth anniversary of his death. Forest supporters remembered the Master Manager during the fourteenth minute of the Reds' league match against Rotherham at the City Ground (September 2018). It's 18 years since the launch of this tribute website, with widespread media coverage, including local and national newspapers and radio reports. The site began on 8th August, 2000, with the support of Brian and his family. Back in 2003, the website received a huge number of 'Get Well' messages for Cloughie following his liver transplant - and they were all passed on to him. The following year, he personally thanked the website editor. In 2010, to mark the website's tenth anniversary, Mrs Clough said she hoped the website would continue for many years to come. You can read her original comments HERE. Marking 18 years HERE. Fans queued-up to meet Cloughie at a series of signing sessions for his updated paperback, 'Walking on Water' 15 years ago (July and August 2003). At one of the events, at WH Smith in Nottingham, he thanked the website editor Marcus Alton for passing on 'Get Well' messages received by the site following his liver transplant. In a BBC interview, he told Marcus about the operation and his appreciation of all the staff at Newcastle's Freeman Hospital. While describing the expertise of his surgeon, Derek Manas, Cloughie dished out the kind of praise that could only come from Old Big 'Ead. He told Marcus: "He's supposed to be in the top three in the country, but he told me he was the best. Conceited - it's incredible. I said to him: 'They'll have to widen the hospital doors if you and I walk in together, because they'd never get both heads through one door, would they?'" There are more great memories about 'Walking On Water' and the signing sessions in our special report. Fifteen years ago, the Master Manager made the headlines by having a kick-about with a group of young footballers during a public appearance. Cloughie coached the under-11's as part of a special event in Nottinghamshire (reported the Nottingham Post, July 4th, 2003). Referring to Nottingham Forest's manager at the time, he told the youngsters: "If Paul Hart continues signing all these young lads, you'll qualify to be picked in about eighteen months!" Cloughie presented the boys with medals and signed copies of his autobiography. He thanked the crowd in Netherfield for a rousing welcome. "You looked after me for twenty years and I'm very, very grateful for that," he said. Burnley's assistant manager Ian Woan has described how he and boss Sean Dyche have taken Cloughie's principles with them. Woan was a first team player under Clough at Nottingham Forest while Dyche was a trainee. The pair share an apartment near Burnley three nights a week and then travel back to their families in Nottingham (Woan) and Northampton (Dyche). Woan was best man at Dyche's wedding. At Burnley, it's clear the man-management strategies picked-up at Forest have stuck with them. "He was special, there is no doubt about that. An aura," reflects Woan on Clough. "I think those morals and manners - please, thank you, excuse me - definitely rubbed off on us and were instilled in us. It's just respect. Cloughie was on sparkling form when he visited an infants school to present prizes, fifteen years ago this month (July 2003). He shook hands with the youngsters as they collected their awards from the Master Manager. Cloughie was the guest of honour at Peartree Infants School, near Derby County's old Baseball Ground. While at the school, he was interviewed by BBC East Midlands Today. Speaking six months after his life-saving liver transplant, Old Big 'Ead praised people who carry donor cards. "To give somebody life, whatever organ it is, people do remarkably well. They are incredibly brave to volunteer this type of thing -- when you say 'take my lungs, take my heart, take my liver, take anything'." Then, in typical Clough fashion, he joked: "I could do with a new right knee at the moment. They want to give me an artificial one. But I am loathed to let it go. It has stood me in good stead for twenty years as a player and twenty years in management. But it's on the blink, so to speak. So, if anyone has got one...I have checked with the Co-op and they are not in til Christmas." Former Forest player Martin O'Neill has been speaking about a rare Cloughie interview he had not seen before. In it, the Master Manager suggests O'Neill could have played in the 1979 European Cup Final instead of Trevor Francis, if he'd been fit. The Independent in Ireland reported how O'Neill had been watching television when the screening of an interview from the archives took him by surprise. O'Neill thought he was familiar with all Cloughie's comments over the years, but this one was new to him. O'Neill reckons the interview was recorded about six months after Forest's 1979 European Cup win over Malmo, when O'Neill had to sit on the bench while Francis made his first appearance in the competition - and scored the only goal of the game. "I'd never seen this interview before," says O'Neill. "And he was saying that Trevor Francis was the luckiest boy in the world to have played in that game because if I didn't have my injuries to contend with, then he wouldn't have started. I'd never seen it until recently. Do you know, it was no fantastic consolation to find out." Fortunately, Clough took Forest to a second consecutive final and O'Neill was part of the starting line-up that beat Hamburg in 1980. There are more thoughts from O'Neill in the Independent (July 2018). A former Cloughie apprentice at Nottingham Forest has described how the Master Manager gave him a fifty pound note for selecting gifts for the players' wives. Steve Guinan said he was injured when Brian drove him to a shop, where he chose chocolate goodies. Guinan began as an apprentice at the City Ground in 1992, near the end of Cloughie's 18-year reign at the City Ground. He recalled: "One day that stands out for me was during a time when I was injured. Clough put his hands on my shoulders and basically picked me up and said 'come with me'. "We went in his big estate car, along with his Labrador 'Del Boy', who was licking my ears, but I was too petrified to say anything! We arrived at a shop and he told me to choose chocolates, magazines and flowers and then once I'd chosen I had to buy 30 of each, which he then gave to the players' wives as a present. "When we got back he took me into his office, made me a hot chocolate and gave me a crisp £50 note as a thank you, kissed me on the cheek and told me to get out!" Guinan now works for the Football Association and the Professional Footballers Association. There are more of his Cloughie memories at Gloucestershire Live (June 2018). The assistant manager of Columbia's World Cup squad has revealed how he nearly signed for Cloughie. Nestor Lorenzo played for Argentina in the 1990 World Cup Final as they lost 1-0 to Germany. The centre-half then began his adventures in England by almost joining Nottingham Forest. Lorenzo told The Sun (June 2018): "Forest wanted me, they almost sold Des Walker to Juventus that summer and Brian Clough called me personally. He explained that if he sold Des that I would sign for Forest. I was at Forest for a week, I was sure I was going to be their player. Then Brian Clough called me and said he couldn't buy me." The disappointed Lorenzo was then approached by Argentinian Ossie Ardiles who signed him for Swindon Town. But financial problems meant Swindon did not achieve their full potential and ended-up being relegated. Lorenzo said he would still like to coach in England in the future. Following the announcement that Arsene Wenger is stepping down as Arsenal manager after 22 years (April 2018), it's time to reflect on those classic Clough quotes about the Frenchman and his team. In one of his last interviews Cloughie said: "It is no exaggeration to say Wenger has become an idol of mine. And from somebody as conceited, biased, bigoted and big-headed as me, that is a compliment." There were many great Clough comments about Wenger and we have searched through our archives to bring you the best - and the rest. Read them HERE. "Without Brian we wouldn't have won any trophy." That comment by former Nottingham Forest and England striker Trevor Francis was featured in a television documentary reflecting on English football's golden years in Europe. Including rare out-takes of Clough interviews, 'When English Football Ruled Europe' on ITV4 (March 2018) brought back marvellous memories of the Master Manager's back-to-back European Cup successes in 1979 and 1980, taking the coveted trophy off the then English champions, Liverpool. Trevor Francis explained he wanted to join Forest because of Cloughie. After signing for the Reds in front of the media, the £1M player was then expected to make the tea for the invited press and TV reporters. His first appearance in the European Cup saw him score the winner in the 1979 final against Malmo. Liverpool legend Graeme Souness, who was part of the Merseyside team beaten by Forest, told the programme that Clough and Forest's success at that time - from Second Division promotion winners to European Champions - was probably the greatest achievement ever in British football. The best selling Cloughie book 'Fifty Defining Fixtures' is now available as an e-book on Amazon. Written by the editor of this website, and published by Amberley, the book is the only one to look at key games during Brian's playing and managerial career spanning nearly four decades. It also contains some more classic quotes from the master of the one-liners as well as photographs from the archives. 'Brian Clough Fifty Defining Fixtures' is the fourth book by Marcus Alton and has been featured in the 'Our Choice' section at Waterstones. You can read more information, plus the chance to buy personally signed copies of the paperback (with 10% discount), HERE, while you can buy the e-book HERE. One of the Cloughie statue fundraisers in Nottingham has recalled the special birthday present he received from the Great Man when he was a schoolboy. Rich Fisher was part of the small group of volunteers who raised £70,000 for the bronze sculpture of Brian in the city centre. The former Forest fanzine editor has now written a book about his exploits while following the Reds for more than twenty five years. Rich recalls that he wrote to Brian to invite him to a tea party at his house to celebrate his twelfth birthday. Although the Master Manager was unable to attend the celebrations with Rich’s schoolmates, a ‘chunky’ package arrived through the post a couple of days later. Writes Rich: “Now back when you were a kid, getting anything in the post was exciting. But when it’s a parcel with a Nottingham Forest postmark – well, the levels of anticipation were frankly off the scale. "Giddy with wonder, I ripped open the brown paper… and I discovered a letter from none other than Cloughie himself – who thanked me for the invite and apologised for his non-attendance, citing the fact that he’d been away sunning himself in Majorca. “But best of all, accompanying the letter was a football signed by the entire Forest squad.” Rich adds that the letter and signed football remain cherished possessions. It’s one of the anecdotes in the book ‘The Church of Stuart Pearce and Other Stories’ which is being launched with a special event at Waterstones in Nottingham on Thursday, March 15th, 2018. There are more details about the book on Facebook and you could win a copy of the book signed by Rich and former Forest star Brian Rice, who has written the foreword, in our latest competition. As Cloughie's former clubs Nottingham Forest and Derby County faced each other in the Championship (March 2018), thoughts went back to April 2004 when the Great Man was asked by a fan: 'Where does your heart lie - Derby or Forest?' Harvey Hopkins had emailed the question as part of a Q&A feature in Four Four Two magazine. Clough replied: "I'm split between the two. I spent one third of my life up until 1993 at Forest and fulfilled everything I ever wanted in management. At Derby, I was young, full of myself and that side I left behind in 1973 was the best I ever managed. It breaks my heart to see the state both clubs are in." The Brian Clough Trophy is up for grabs each time his two former clubs play each other. More details here.